I don't write about basketball very often. Never, really. I guess I write about UVa hoops occasionally, but that's generally less about basketball than it is about my alma mater, if that makes sense. Today, I'm thinking about basketball, and the reason I'm thinking about basketball is that LeBron James is returning to Cleveland. This LeBron free agent drama has been fascinating to watch, but I can't say I've been following it closely. Mostly, I've been keeping up with the latest news via Twitter, but that's as far as it has gone. Now that the decision has been made, I can't get over how good this story is. So many interesting angles, and it concludes with the return of the prodigal son to the Sixth City. I don't care about the Cleveland Cavaliers. Never have. Growing up, I picked a favorite team almost at random, since there were no NBA franchises within spitting distance of my home. I chose the 76ers, almost exclusively because Julius Erving played for them. You might remember Dr. J. Even on the downside of his career, he appealed to an 8-year old boy. Over the years, the Sixers haven't exactly been the model NBA franchise, but they have allowed me to watch and admire the talents of Erving, Charles Barkley (surprisingly, I can't find an image online of the Barkley poster that adorned my wall as a teenager), and Allen Iverson. If the Cavaliers had had some dynamic player back then (sorry, Ron Brewer), I suppose it's possible that I would have decided to root for Cleveland. I think my son is about to do exactly that. And I'm okay with that. I like superstars. In every sport. Part of the joy I get from watching sports -- and between the Reds and UVa, sometimes joy is difficult to come by -- is from watching the greatest players in the game ply their trade. I never joined the chorus of criticism of Barry Bonds back in the day; instead, I was mesmerized by his baseball talent. In soccer, Luis Suarez bites everyone in his way and is a bit of a lunatic, in general, but he's a genius on the pitch and I'll watch him every chance I get. LeBron doesn't fit into that same mold, but he has certainly been (unfairly) cast in the role of a villain since "The Decision." I'm not going to try to make the case that the way James made the decision to take his "talents to South Beach" was anything less than a PR disaster, but it has been absurd to see how everyone decided they hated LeBron James all of a sudden. For the last four years, most everyone has reveled in the LeBron jokes and rooted against him at every turn. For his part, LeBron just won some MVPs and some championships and cemented his place in basketball history. He also became as a billion-dollar industry. His move back to Cleveland enhances that brand name to an almost unimaginable degree. I think the days of LeBron as villain are over; he's now going to be a hero and a global icon on a scale that we haven't seen since Michael Jordan. It will be amusing to see NBA fans who were previously hostile to LBJ twist and turn to praise him for "coming home." Not me. I've always been in awe of his talent, whether they were displayed in the midwest or South Beach. I'll watch more Cleveland games this year than ever before probably, and I'll never watch the Heat as often or with as much interest. That's because LeBron is the greatest player on earth and I'm not ashamed to follow him wherever he goes. I love watching the greats. Michael Jordan was never my favorite player (Erving/Barkley, remember? ), but there is something that I used to say about MJ that applies to LeBron, as well. Every single time I watched MJ play, he did something that made my jaw drop. Maybe it was a crossover, or a pass, or a dunk, but you always got your money's worth with MJ. Same with LeBron. I don't think I can say that about any other basketball player in my lifetime. Other than Spencer Hawes, perhaps. I'm very interested in the unorthodox rebuilding job that GM Sam Hinkie is doing in Philadelphia. Can't wait to see how that turns out, and I'll keep watching the Sixers while the building process continues. After Cleveland drafted UVa great Joe Harris a couple of weeks ago, I figured I'd be watching more Cavaliers basketball this year than before. That's a certainty now. Tony Bennett is still looking around, possibly seeking to add another player to the 2010-11 recruiting class. Bennett already has about thirty new kids in that class, so what's another one? I'd be pretty surprised if Bennett actually signed someone else. There are six kids coming in as first-years this fall, and I can't imagine they'll want 7 kids in the same class. To add another, it would have to be a player that the staff just couldn't pass up, and there aren't many of those guys still available. Three straight hoops posts at the end of April; that's extreme, even for me. But I thought I'd pass along the ACC Sports Journal's pre-pre-preseason ACC predictions. With only five scholarship players returning and six incoming first-years, Virginia is picked about where you'd expect. While watching the Dallas-San Antonio NBA playoff series, I keep having the same thought, and it came back to me while writing the post below about Sylven Landesberg. We need more former Virginia players in the NBA. Roger Mason, Jr., is really the only former Hoo in the NBA right now, though Mason's Spurs are playing against a team coached by Rick Carlisle. Marc Iavaroni is still kicking around as an assistant coach. I am convinced that Sean Singletary will have a good NBA career...eventually. Anyone else I'm missing? That's a pretty thin roster of Hoos who are kicking around the league, only one of whom is a current player. If Singletary and Landesberg make NBA rosters next year, that'll be three, and that's a start. After seeing how much Tony Bennett's NBA career seems to have helped him in recruiting, I can't help but think having former Virginia basketball players playing in the world's best basketball league would help in the recruiting process, as well. Unfortunately, no one on the current roster appears to be a likely bet to make a future NBA roster. I have high hopes for the incoming recruits, but it's too soon to tell. At least our list of NBA players is more accomplished than this one. 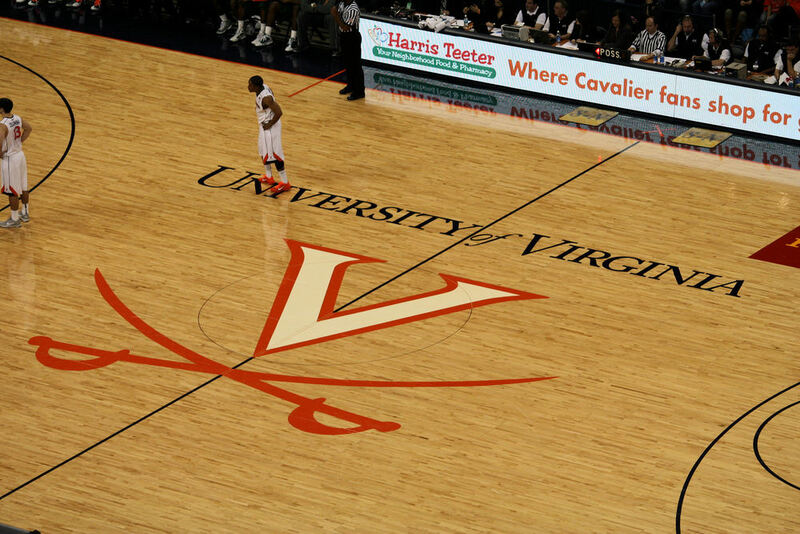 What would you tell high school basketball players if they asked you if UVa was a good place to play basketball? besides your teammates, what will you miss most about UVA? Should i be mad at Coach Bennett for you leaving? Sylven made a dumb mistake by skipping that class, and Coach Bennett had little choice in his response...but we need to remember that Landesberg is still a kid. He planned on going pro after the season anyway, and I hope he has a ton of success. I hope Hoos will give him the benefit of the doubt. I don't know if Billy Baron will end up being a star or not. He wasn't very highly recruited, frankly, but he does appear to be exactly the type of player that will thrive in Tony Bennett's system. He also appears to be the type of player that UVa fans will enjoy: a hard-nosed kid who plays hard and, perhaps more importantly (given what we've seen over the last decade), who plays smart. There have been times since the New Gillenium began that I would've given my kingdom for a few players who didn't take bad shots and make bad decisions. I'm so tired of that, but I'm very optimistic that Bennett is going to change that. At any rate, what brought on this rambling post was this Daily Progress profile of Billy Baron. Check it out. Lots of interesting news around Wahoo Nation today: --Assane Sene needs to eat! --Jeff Jones has announced his transfer destination: Rider. I wish Jones all the luck in the world. --Sammy Zeglinski is recovering from hip surgery. With only five scholarship players returning, Tony Bennett's 2010-11 squad is going to be interesting to watch. 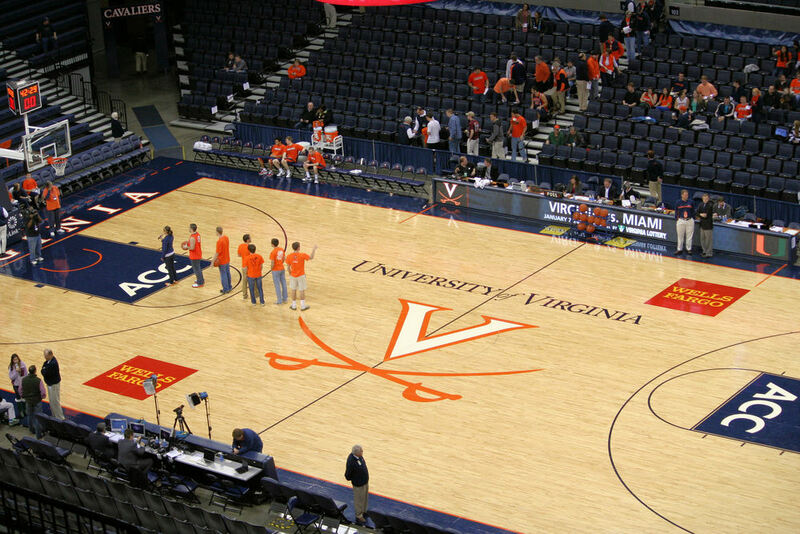 It may not always be fun, but the development of the group will be interesting to UVa partisans. In Tony We Trust. 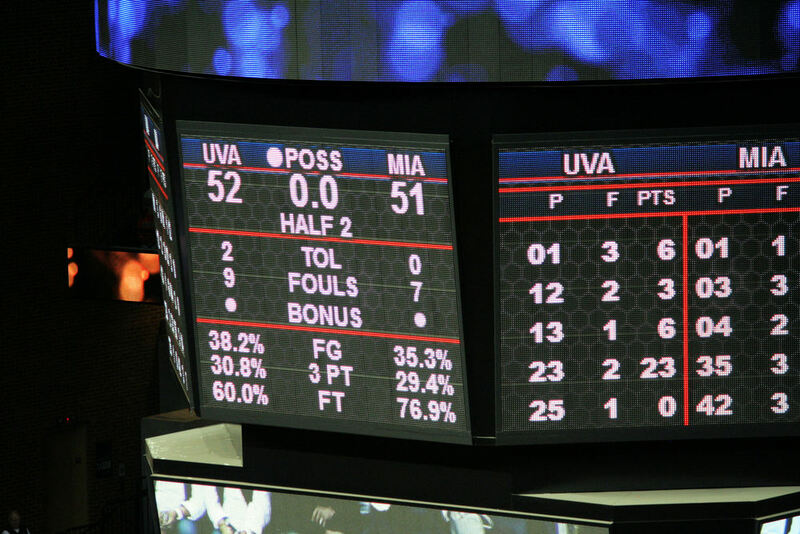 The Hoos hammered North Carolina. My other alma mater destroyed Duke. In the same weekend. It just doesn't get any sweeter than that. Sylven Landesberg scored 29 points and Virginia ran off 18 unanswered points early in the second half to beat struggling North Carolina 75-60 on Sunday night. Sammy Zeglinski added 19 points for the Cavaliers (13-6, 4-2 Atlantic Coast Conference), who regrouped from consecutive losses to earn another impressive victory under first-year coach Tony Bennett. Virginia had lost 63 of 68 meetings in Chapel Hill, but blew the game open by holding the Tar Heels without a field goal for nearly 8 minutes in front of a stunned Smith Center crowd. Wow. I'm still stunned, myself. Landesberg was incredible tonight, one of the best performances I've seen from the young guy. The defense, however, was simply spectacular. 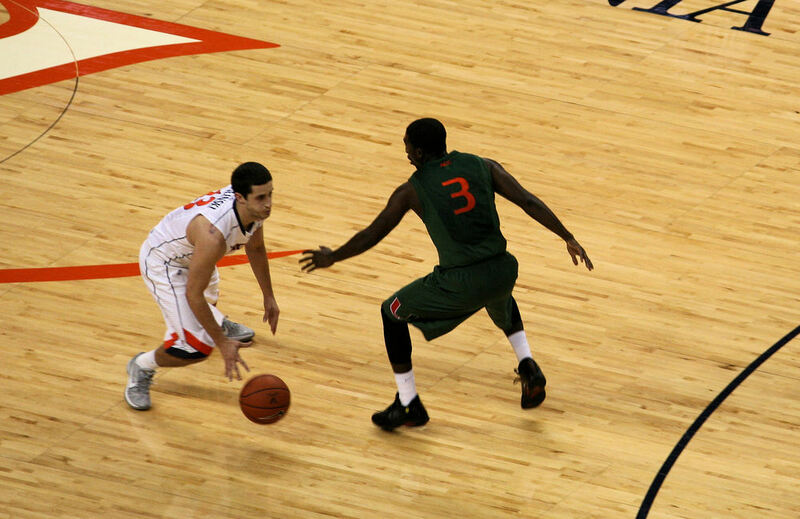 The Hoos held UNC to 36% from the field, and they got a stop every time they needed one. 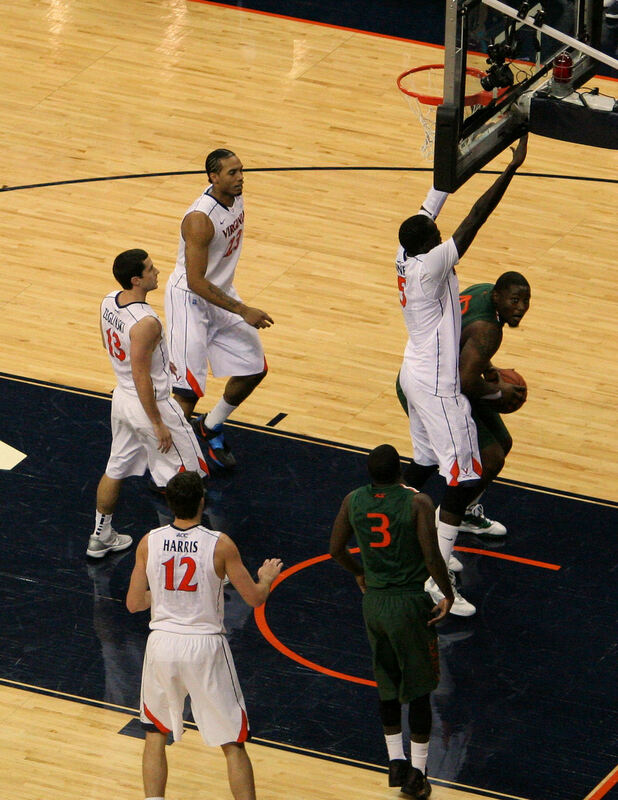 Jerome Meyinsse blocked 3 shots, and all were important. You can't help but be happy for Jerome. He's having a great senior season. Up next: NC State comes to Charlottesville. 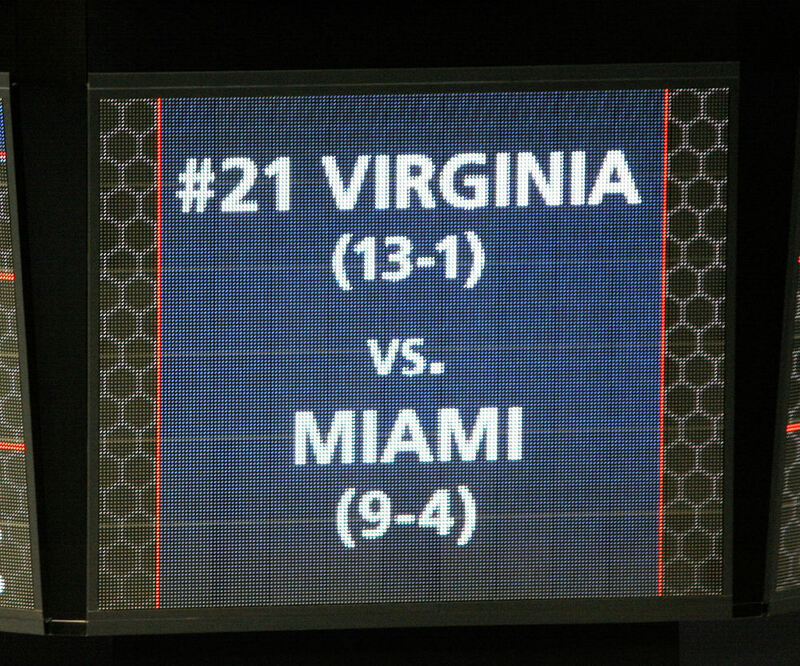 With a win, Virginia would improve to 5-2 in the ACC, and that's almost unimaginable. Heck, if they hadn't given away the Tech game, they'd be 5-1 now and in control of the conference. Oh well, I'm not going to complain. It's a night to celebrate. Way to go, Hoos. 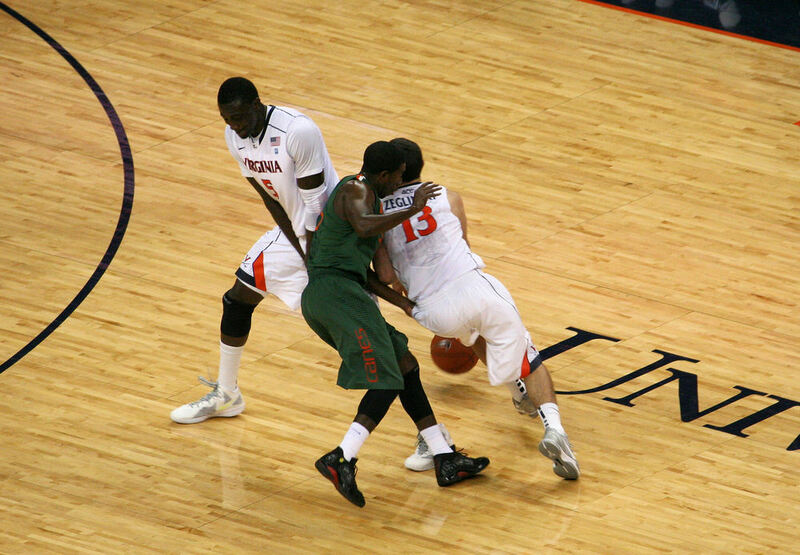 I'm sick to my stomach after watching Virginia collapse like that. If I say anything more, it's likely to be something I will regret. That said, I'll leave it at this: every single person associated with the Virginia basketball program should be embarrassed by that performance down the stretch. A complete joke. Over at Dear Old U.Va., Ben takes a very interesting look at Virginia's offense, and asks if they are headed in the wrong direction. I agree with his general observation that sample sizes are too small to draw any grand conclusions. The problem Tony Bennett's squad is facing is that they really don't have very many legitimate ACC weapons in the offensive fold. Sylven Landesberg is a stud, and Mike Scott is a good low-post threat, and several others complement those two...but it's tough to win in this conference without more serious threats. 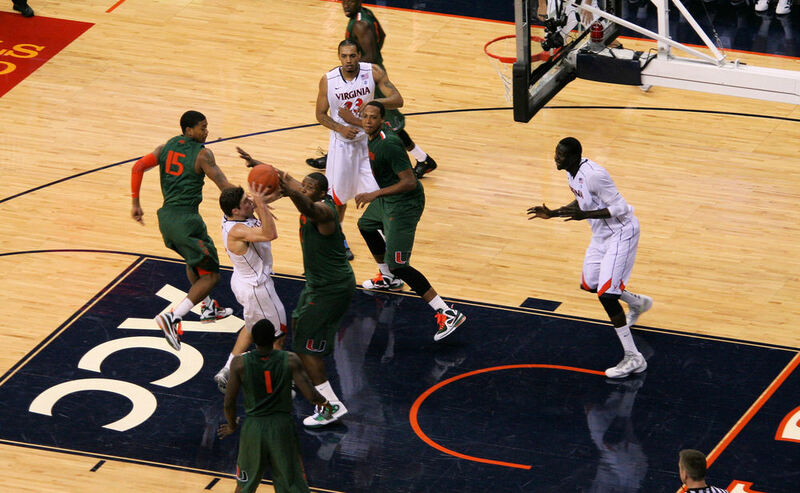 That said, the team is efficient, they handle the ball well and take good shots. That goes a long way. Just ask Bob Knight, whose teams relied on just those offensive principles for years. Can't wait for the Hokies tomorrow! Yeah, we had an ugly game this weekend, but the Hoos are still tied for first place in the ACC. That's a good thing. Also a good thing: one of my good friends, since childhood, has always been a huge fan of the UNC Tar Holes. I saw him this morning. I very much enjoyed asking him about the ACC standings. He refused to answer. Gotta take these opportunities while I can. Fun, fun, fun.